Helping those who don’t need it over those who do. When it comes to writing letters that read like press releases, the office of Gov. Bill Haslam has it down pat. It may be the only thing they do well, other than cow-tow to Lt. Gov. Ron Ramsey. But when it comes to putting pen down to paper to actually propose a plan…one that he even is pushing for…its just too much for him to muster. So this morning when I heard him talk about his “Tennessee Plan” on an endless loop…a plan that, by the way, only exists in his head, MY head nearly exploded because I knew it was a crock. Haslam was in town yesterday on a (campaign) swing through the Greater Memphis Chamber of Commerce’s annual luncheon. It wasn’t an official campaign swing mind you, but it might as well have been. In fact, the Governor has sent no real details to the Feds of what his “Tennessee plan” would be…which is why when the Tennessee House Democratic leadership calls the whole thing a farce, they’re being too kind. This is messaging over meat. This is the healthcare policy equivalent of “let them eat cake”. This is complete and utter BS. The Governor has no real plan to expand Medicaid, even though 63% of the state wants it. What’s more, there’s no plan to have a plan. Just more talk, more wait and see until the money runs out. So when working people who don’t have insurance at work get sick, the Governor will continue to not understand why they’re getting poorer…even though healthcare costs have traditionally outpaced the inflation at a rate higher than anything but college tuition. This is called “willful ignorance” and its sick that the Governor thinks he can tout it as “leadership” and not get called on it. @vibinc Mr. Haslam only cares about Mr. Haslam. And Mr. Haslam’s bank account, portfolio, & profits. Just another corporate shill. So his “response” to the Feds’ request for details on his plan is just a pretense. Do you see any hope for Medicaid expansion in TN? No. Gov. 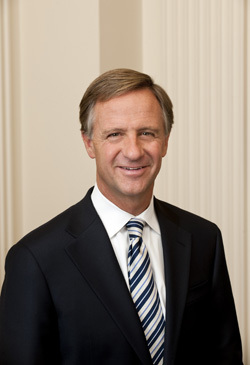 Haslam has no intention of ever even presenting his “plan”, which is identical to the one Gov. Pence of IN is “proposing”. When Sebelius said in Nov. here in Memphis that the state had presented no plan, after months of the Gov. saying they’d “been in talks”, that told me he has no intention of ever submitting a plan, or doing anything other than talking. You gotta love the politics in this sate: All Right Wing, All The Time. Jonathan Cole liked this on Facebook. Randall Rice liked this on Facebook.